Where to begin with this strange slippery film? It's genre, tone, dramatic tensions shift and evolve over its two hour running time until it becomes something quite hard to pin down? Is it a melodramatic period romance like THE BEGUILED? A Hitchcockian psychological thriller? A generational ghost story? A fetishistic romance like THE DUKE OF BURGUNDY? It's a film that certainly delights and repays the audience with a knowledge of film history. And yet it's something quite hermetically sealed and delicately balanced between difference style of film-making. It's a film one can imagine quite hard to pull off without an absolute conviction in what one was creating. But in its exploration of intense emotional relationships in a tightly proscribed world, it reminded me most of all of Peter Strickland's dreamy romance. Daniel Day-Lewis (LINCOLN), in his final role, plays Reynolds Woodcock, a 1950s fashion designer who lives and works in a grand London house, complete with royal clientele. As the film opens, he is presented as the kind of domineering, egomaniacal man surrounded by sycophantic enablers that has become vilified in the #metoo movement. He lives by strict rules all designed to give him, the self-appointed genius creator the peace he needs to create. He fears discombobulation. And in a sense there's a delicious irony in the fact that the first of his dresses that we see is comically ugly - it's the fawning delight of his clientele - here Gina McKee - that tells us all we need to know. Reynolds' perfect world is curated by his devoted sister Cyril (Lesley Manville - veteran of Ken Loach films). She neatly dismisses the young girls he takes as his muses when they become tiresome, and manages the financial side of the business. As the film opens we see her dispatch one girl only for him to speed to the country and pick up another, mostly on the grounds that she looks biddable and can remember his vast breakfast order. Both women seem at his service. The young Alma (Vicky Krieps), takes orders from him, becomes little more than an inanimate model, and hangs on his every word. And so the relationship might follow the typical pattern. Alma - scraping her butter onto her toast so very loudly - might soon be dismissed. The beauty of this story is that it subverts our expectations of who is truly in control and indeed who are the true protagonists of the film. This is the way in which it most profoundly reminded me of THE DUKE OF BURGUNDY. One thinks this is going to be a film about subservient women but actually they are firmly in control. As the film progresses we see that Cyril very much rules Reynolds - forcing him to attend a wedding to keep the House in business - daring him to pick an argument that he cannot win. Even the seamstresses are more in control than Reynolds - he is dependent on them to bring his designs to life. And so the principal tension of the film is not really between Reynolds and Alma - as we shall see later - he is only feigning resistance to her. It's actually between Alma and Cyril. The young girl knows her mind and politely but firmly brooks no objections to her plans. She is vying with the Cyril to take control of Reynolds, and by a masterful piece of skulduggery, wins. The question is how Reynolds will take to this change in reign, and it leads to a superlative set piece at the end of the movie, where very little is said, but suspicions are noted, and accepted. It's quite the marvel. The result is a film with very clear themes if subtly slippery means of getting there. Reynolds misses his dead mother terribly to the point of almost willing her ghost into existence. He craves a replacement - first Cyril and then Alma. He is forever ravenously hungry for nourishment, and at the most basic level, Alma provides it, naming him in their opening meeting "hungry boy". What she gets out of the relationship is the ability to express her side of the fetish. It is no coincidence that the most passionate kiss between the two that we are allowed to see in this very coy and ambiguous film comes when the sado-masochistic relationship is finally acknowledged on both sides. Everything about this production is first class - from the costumes, to the interior design, to the evocation of the British sea-side and 1950s ballrooms. The acting is also superb. Daniel Day-Lewis may be getting the awards, but Manville and Krieps match him turn by turn with performances of such subtlety and brilliance. The script is also fascinating, and funnier than one often expects from Anderson. Genuinely brilliantly funny. There was only one scene that struck a bum note - when Reynolds and Alma look through a client's deep distress and mock and punish her for her drunken escape. This was cruel - meant to be cruel - but lessened my interest in the characters. And this is ultimately my only real criticism of the film. All of Anderson, and his cast and crews talents, on such a self-involved, and ultimately slight story. There's something a little disappointing in that - something small - lesser than THERE WILL BE BLOOD and THE MASTER. 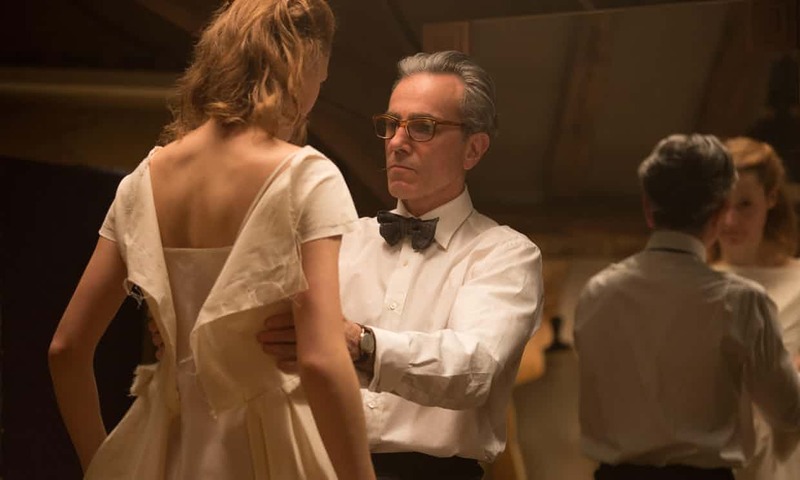 PHANTOM THREAD has a running time of 130 minutes and is rated R in the USA and 15 in the UK for strong language. The film was released last year in the USA and earlier this year in Canada. It goes on release this weekend in Singapore, Australia, Czech Republic, Germany, Greece, Hungary, Israel, Kuwait, Portugal, Slovakia, Spain, the UK and Ireland, It goes on release on February 14th in France, Denmark and Russia; on February 22nd in Brazil, Italy, Malaysia, Finland, Portugal, Sweden, Taiwan and Vietnam; on March 1st in Netherlands; on March 8th in Hong Kong and Estonia; on March 15th in Argentina; on April 13th in Norway and Turkey and on May 26th in Japan.